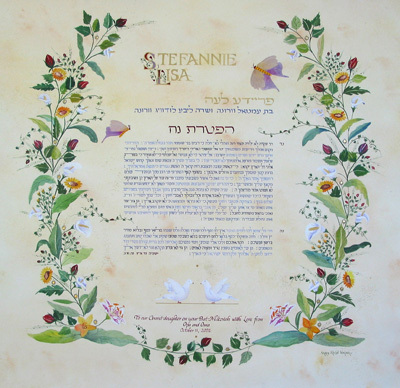 The Bat Mitzvah Haftarat Noah is written in three shades of purple on the "parchment" background and illuminated with delicate Sunflowers and Roses as well as tiny Rosebuds and two soft coloured Butterflies. The name of the Bat Mitzvah girl is illuminated in purple and red. Ink: Watercolour, Gouache, Dry Pigments, and 23K Gold Leaf (optional).